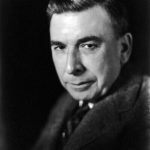 Booth Tarkington was an American novelist and dramatist best known for his novels The Magnificent Amber sons and Alice Adams. He is one of only three novelists to win the Pulitzer Prize for Fiction more than once, along with William Faulkner and John Updike. "So long as we can lose any happiness, we possess some."